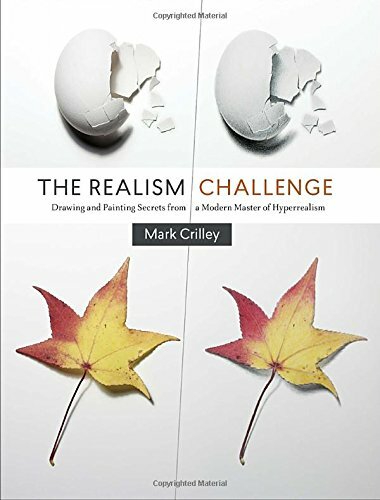 After creating a few viral videos on realism drawings, Mark Crilley has finally come up with a book that shows you just how he draws those amazing realistic artworks. The Realism Challenge goes behind the scenes with several tutorials that teaches the skills and techniques required to bring realism to your drawings. Through the step by step demonstrations, you'll learn how to observe your subjects, put down the lines to form the shape, and proceed on to colour and adding shadows. The instructions are very clear and are always prompting you what to look out for. For it's all those little details that create the realism. One thing about realistic drawings is they take time. Even drawing something like a piece of paper, cracked egg or a handful of pieces of popcorn takes a good involvement of time. Techniques are important but observational skills are almost as important or even more so. I've tried several of the exercises and realised that I was going too fast. One really has to slow down to observe all the subtle changes in colours and shades in your subject. This book certainly demands patience. There are thirty lessons in the book and that's a lot of opportunity to get your practice. The payoff is a beautiful piece of artwork. Ultimately, it's quite fun to challenge yourself to complete the drawings. Through the book, you'll also learn to create textures like those on a piece of toast, metallic surface, transparent bottles, food, etc. The only downside is the source photos could have been printed much bigger, perhaps one page so that people can see the subjects bigger. For example, it's not easy to make out the details of small seashells in one of the lessons. Highly recommend to all who loves to draw.